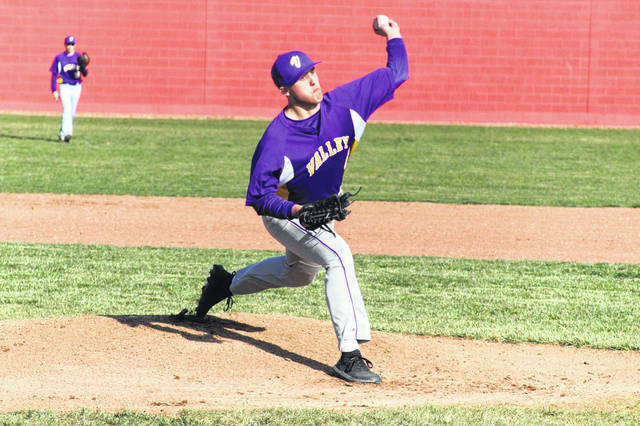 Valley senior Tanner Cunningham struck out 13 Senators in the Indians home win over West Wednesday night. Valley (4-7, 2-5 SOC II) picked up a huge bounce back win over SOC II rival West (4-4, Wednesday night following their loss to Clay Tuesday. Senior Tanner Cunningham had a Tanner Cunningham-like performance on the mound Wednesday night. The senior ace threw for 7.0 IP allowing just five hits, one earned run, and striking out thirteen Senators batters. Jake Ashkettle picked up the lone RBI for the Indians in the win while finished 2/3 at the plate. Cade McNeil finished 2/3 at the plate for West with the Senators lone RBI. Portsmouth (2-6, 1-3 OVC) dropped their third OVC game of 2019 Wednesday night, a 3-1 decision in favor of the South Point Pointers. Senior Danny Lattimore picked up the lone RBI for the Trojans Wednesday while going 1/3 at the plate. Caeleb McGraw finished 3/4 at the plate in his four plate appearances for Portsmouth. On the mound, Daewin Spence pitched a solid game throwing 6.0 IP and allowing just six hits and three earned runs while striking out four Pointers’ batters. Green (9-1, 5-0 SOC I) picked up another SOC I win Wednesday night, this time over Western. Senior Tayte Carver and sophomore Trevor Darnell combined to throw a no hitter Wednesday against the Indians, the Bobcats first combined no-no in 2019. For the game, Green collected sixteen hits. Leading the way at the play was Eli Webb who finished 3/3 with three runs scored and a double, Levi Singleton who finished 2/3 with a double and three RBI, and Ethan Carpenter who finished 2/2 with a double and two RBI. East (2-9, 2-6 SOC I) picked up their second SOC I win over Notre Dame (0-10, 0-7 SOC I) in as many days Wednesday, 18-8. Kyle Flannery pitched a complete game for the Tartans earning his first win on the mound this season. Flannery allowed just four earned runs while giving up eight hits and striking out six Titans batters. Sully Paishon had another big day at the play for East, this time going 4/4 with a run scored and a game high five RBI. Tyler Winston and Luke Bradley each drove in three runs apiece in the win while Dylan Bailey and Ronnie Will each drove in two runs apiece. For Notre Dame, Chris Schmidt led the way at the plate by going 1/3 with two RBI. Jake McGuire, Caleb Nichols, and Tyler Herrman each drove in a run as well for the Titans in defeat. Wheelersburg (10-1, 6-0 SOC II) picked up a much needed win over SOC II rival Minford (7-3. 5-2 SOC II) Wednesday night, a they’ll need if they hope to solidify their top spot in the SOC II. Addi Collins came up clutch for the Pirates when she knocked out a solo home run in the top of the sixth inning to give Wheelersburg their 2-1 win. Laney Eller drove in the other Pirates RBI in their win Tuesday while finished 2/3 at the plate. Wheelersburg ace Sarah Claxon finished pitching Wednesday after 5.2 innings giving up just one earned run and eight hits to Falcons batters. For Minford, Madi Sifford picked up the lone RBI for the Falcons on her only hit of the night in four plate appearances. West (3-9, 2-5 SOC II) picked up their third SOC II win of the season Wednesday night over Valley (0-9, 0-7 SOC II), 11-9. At the plate, West was led by junior Morgan Rigsby who finished 1/4 at the plate with a team high three RBI. Five other Senators picked up a lone RBI Wednesday: Lainey Ayers, Haivan Dillow, Abbie Boland, Abbie Pack, and Nataya Richards. For Valley, Indians sophomore Kylie Bell finished 4/5 at the plate with a game high four RBI. Waverly picked up a 3-0 win over SOC II foe South Webster (12-5, 5-2 SOC II) Wednesday. From the mound, Gwen Messer pitched a complete game while allowing eight hits and zero earned runs. Northwest (2-7, 0-7 SOC II) fell to SOC I foe Oak Hill Wednesday 11-1 in seven full innings. Sara Smith drove in the lone Mohawks run driving in teammate Addi Newman who finished 2/3 at the plate. Notre Dame (11-0, 7-0 SOC I) improved their perfect start in 2019 with a 14-0 win over East (2-10, 0-7 SOC I) in five innings. Maddy Suter and Taylor Schmidt led the Titans efforts at the plates Wednesday night. Suter finished 3/3 with four RBI while Schmidt finished 2/2 with a home run and four RBI. From the mound, junior ace Cassie Schaefer was lights out. Schaefer pitched all five innings allowing just one hit and striking out eight Tartans batters. Hannah Ginn picked up the lone hit for the Tartans off Schaefer Wednesday. New Boston (2-9, 1-5 SOC I) fell Wednesday in SOC I play to Eastern, 12-4. Lexus Oiler knocked out her second home run in as many games Wednesday while finishing 2/3 at the plate. Morgan Kitchen drove in a team high two runs on 1/2 hitting while teammate Taylen Hickman drove in the other Tigers run on 2/3 hitting.